Later this month, the Los Angeles Times plans to publish a database of teacher performance in the LAUSD. Their metric is something called “value added,” which projects a student’s performance based on past tests and then compares it to actual results at the end of the year. It’s designed to control for things like poverty levels, the quality of the students, social factors, and so forth. The initial database will include only third through fifth grades and only teachers who have taught 60 or more students. Mr Duffy’s reaction fits with a broader resistance to more formal evaluation methods by teachers unions across the country. And that has coincided with extensive union efforts to defend teachers who are obviously failing our students. If the education-reform debate has come to seem like an attack on teachers, it is in large part because of the unions’ misdirected passion and priorities. There is no perfect way to evaluate teachers, but that is true of many jobs. (Should The Economist judge me on how much traffic this post gets? How much ad money it generates? How sharp the analysis is? Can that even be measured? How should each be weighted?) The problem is that the big teachers unions have not been credible participants in the conversation about reform, resisting efforts to incorporate test scores in the evaluation process, and fighting the consequences that must accompany bad evaluations. For its part, the Times plans to publish an online database with ratings for more than 6,000 elementary-school teachers based on test-score data. That is not fair to the teachers, who deserve a more comprehensive evaluation. But who is to blame for the absence of one? Is this a fair reaction? I don’t live in Los Angeles and don’t follow its affairs closely, but there’s at least one thing I can say about this: every single person I know who does follow LA politics, both liberal and conservative, thinks the LAUSD is a complete disaster. Obviously some of this is simply because LA has all the usual pathologies of urban school districts: it’s huge, it’s heavily poverty-ridden, it’s fantastically expensive to build new schools, and virtually all the middle class parents who normally drive concerns over quality have long since abandoned it for private schools. Still, even beyond that LA seems to be almost uniquely bad. So should the Times be doing this? Regardless of LA’s specific problems, I think so. The data is public, and either you believe that the press should disseminate public data or you don’t. I do — despite the fact that I know I’d be pretty unhappy to be one of the teachers included in this project. In any case, I’ll be curious to see what the reaction is. Obviously you’re going to get a bell curve of performance. So the question is: how far down the bell curve do you have to get before you think a teacher ought to be dismissed? I suspect that most people have pretty unrealistic notions here. In the white collar private sector I’d guess that maybe one in twenty people is ever let go for performance reasons, but parents who look at the Times database are probably going to be disturbed by any teacher in the bottom quarter or so. But what do you do about that? Somebody’s kids have to be taught by below-average teachers, and that’s all a teacher at the 25th percentile is: below average, not an incompetent dullard. Unfortunately, there’s one likely reaction to the Times project that will be entirely non-positive: the most active, engaged parents will aggressively use the database to make sure their kids get the best teachers possible while the poorest, most distracted parents will barely even know it exists. The former already have the smarts (and the income) to shop around for the best schools, and now they’ll have the tools to shop for the best teachers within each school. As long as they get those teachers, they won’t care much about all the other classes, and primary education in LA will become even more stratified than it is now. That might not happen. I’m just guessing here. 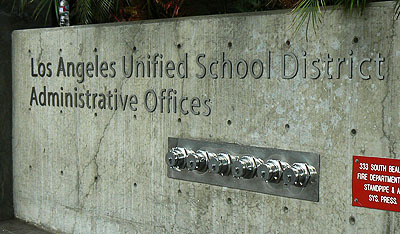 But one way or the other I hope the LAUSD is prepared for this. Once this data is out, the fight to get the best teachers will be in full swing with a new school year just weeks away. It might not be a pretty sight.